Cajun Country Run (CCR) started in 2002 and became a primary supporter of TRAIL in 2010. Today, the event offers 5 running options. The road race options include a half-marathon (a USATF certified single loop), a 10k (USATF certified) and 5k. The trail courses include a 10k & 5k that offer a mix cross country and single track sections. The 10k course will take you on some technical sections along the banks of the Vermilion River. The hallmark of the CCR is the home made alligator head trophies, compliments of CajunBens.net. Proceeds from the CCR have allowed TRAIL to do work in and around Acadiana Park. In 2012, TRAIL purchased property to add to the Acadiana Park & Nature Station. TRAIL has also help fund some improvements to the mountain bike trail system built and maintained by Mountain Bike Lafayette. In 2018, TRAIL teamed up with Joshua Wilson, Boy Scout Troop 271 of the Evangeline Area Council to install two benches and eight map stands to guide visitors throughout the northern section of the Acadiana Nature Trails. Complete the three race series to receive an exceptional medal and all the glory! Thanks to Giles Subaru and, we have FREE photos for all runners. Check out the thousands of FREE photos from 2016 Cajun Country Run and 2017 Cajun Country Run. Please let Giles Subaru know how much you appreciate their continued sponsorship of Cajun Country Run and TRAIL Events! 1st Male & Female to cross the finish line each distance (half marathon, 10k & 5k). During the award ceremony our judges will rate and award prizes to those individuals and groups dressed up in Santa Claus costumes & who participated in the race. Your bib number should be present at all time. Judging will be based on enthusiasm, completeness of costume, and you must have done the run in most of your costume. Each winner will receive a Santa's bag full of prizes and gift certificates from our sponsors, just in time for Christmas! From I-10 take the Louisiana Ave exit. Go South on Louisiana Ave. then take a left onto Willow St. then right onto Teurlings Drive. After crossing over the rail road tracks on Teurlings Drive take the first left which will bring you into the parking lot of the school. From Hwy 90/Evangeline Thruway/I-49 turn onto Willow St. heading East. Then right onto Teurlings Drive. After crossing over the rail road tracks on Teurlings Drive take the first left which will bring you into the parking lot of the school. From Pinhook Rd. If you are coming from a point Midtown Lafayette area or South of Lafayette using Hwy 90 and heading North, then take Pinhook Rd. Pinhook Rd becomes Teurlings Dr. (after it crosses Carmel Dr./Breaux Bridge Hwy). After crossing over the rail road tracks on Teurlings Drive take the first left which will bring you into the parking lot of the school. Aerial diagram of the start/finish line, parking, and day of registration and packet pickup. 7:00am - 8:15am: Race day Registration & Packet Pick Up for all events. The starting line for the all runs is in Acadiana Park in between the basketball courts, pavilion, and tennis courts. Use 1205 E. Alexander St., Lafayette, LA for your GPS device. The start is a half mile from the main parking area at David Thibodaux STEM School. Because there is minimal parking in and around Acadiana Park, most of which will be closed, we suggest parking at the school and taking the shuttle or getting in a short 800 meter warm up run. Cajun Country offers 5 distance options to race making it the ideal run for any skill level! In addition to the Half Marathon, we also provide options to run 10k or 5k on either all-road or off-road trail courses. Check out the 10k and 5k road courses below. This is a smooth, fast course. Three small climbs of less than 30 feet, the best that flat Cajun Country can offer. USATF certified! There are 7 water stations and 2 restroom stops along the course. This is a smooth, fast course. Two small climbs of less than 30 feet, the best that flat Cajun Country USATF certified! You will encounter 2 water stations twice. Nice fast and flat course with a big finish. There are two small climbs of less than 30 feet. There are 3 water stations on the course. This course has 3 water stops with one water location used twice. The course starts with a run across a field then funnels down into a single path nature trail. Then it is through the Nature Station and through the woods on wooden decks then out to the levee of Francois Coulee. Just after mile two there is a water station and restrooms when you cross the coulee at Shadow Bluff Dr. Then it is a relatively flat meandering course under the shade of trees. Around mile 2.8 the 5k and 10k courses will split. The 5k will turn left and head North toward the next water station, where you will turn left and both the 10k and 5k course merge. As you exit the canopy of the Northern section of the Acadiana Nature Trail (ANT) you will have a third water stop (with restrooms) and about 1.5 miles to run. If you registered on RunSignUp you can access your account from the confirmation email where it says "To update or complete additional information for your registration, click here" located (just above the barcode). This will take you to "My Registrations and Races" under your profile where you can make your changes, including race distance and t-shirt purchase. If you registered on a site other than RunSignUp from the confirmation email where is says "Manage your Registration" (just above the barcode) and create a free profile account. You will then be sent an email to verify your account. Once you have verified your account come back to the confirmation email and click "To update or complete additional information for your registration, click here" (just above the barcode). This will take you to "My Registrations and Races" under your profile where you can make your changes, including race distance and t-shirt purchase. 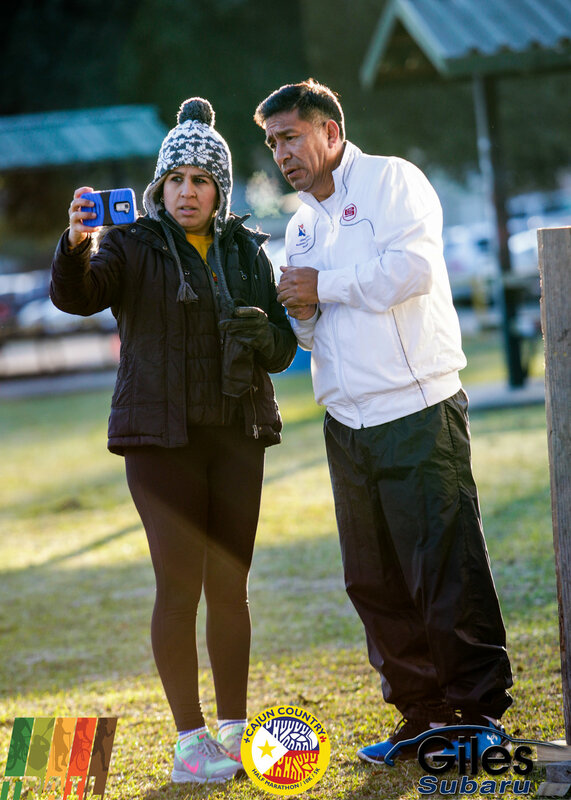 Refunds: Cash refunds are not allowed for Cajun Country Run 2018 but we do permit people to transfer their registration to another TRAIL promoted event (such as Tour de Atakapas or Cajun Country Run 2019) as long as you notify us one week prior to the event of Cajun Country Run 2018 (Dec 8, 2018) by emailing us at info@latrail.org with the subject "Please Transfer my Registration" and in the body text specify your name, which event you are transferring from and which event you want to transfer to, as well as your contact information (name & phone). If there is a price reduction, there is no cash value or partial refund.